Coming off of the Thanksgiving holiday, I’m thankful for life’s messes. The mess of my office, the messes in my studio, the messes my kids bring to my house, etc. all serve as reminders of past accomplishments and things I hope to accomplish in the near future. These messes also spark creativity; there is an element of random connection, a synapse of the objects that wind up in close proximity to one another. I’m also thankful for the messiness in learning. I’ve been wrapping up edits to the University of Michigan work this week and in so doing returning to some of the notes I made during my visit to that campus. One set, written during a large statistics class office hour, is on this necessary messiness. 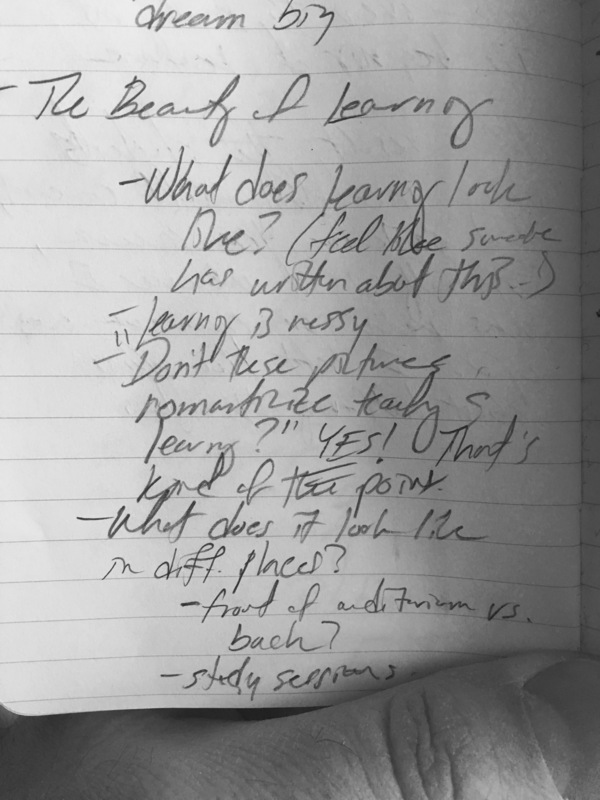 It’s nestled under the heading “The Beauty of Learning” – something I’ll come back to in another post. It’s an observation of something I think we often overlook in teaching – those moments and spaces in which the real learning sometimes (most of the time?) takes place. Some of these, like this office hour, are beautifully organized, somewhat chaotic moments in which students’ ideas and questions flow freely – papers and laptops strewn about, pens waving. Others are less organized or intentional, like the learning that takes place in the back row of a crowded auditorium, parallel to but completely detached from the lecture happening down in front. In my own teaching career, I’ve been learning to allow for, embrace and encourage these messy learning situations as much as I can. Early on, I thought maybe this was easier in my discipline than in others. Arts education often demands yielding to such moments. As I continue to work with faculty from all areas, I’m positive no one discipline has claim to these opportunities. They simply look a little different department to department.